Controlling and manipulating the interaction of light with nanostructures offers the promise of new and innovative technological applications ranging from nanolasers and sensors to quantum computing. However, in spite of tremendous advances in nanotechnology that has enabled the fabrication of one and two dimensional structures (such as photonic crystal cavities), efficiently integrating nanocrystal cavities with modern optical fibers in communications networks is proving to be difficult. Here, Kohzo Hakuta and colleagues at the University of Electro-Communications, Tokyo, report on the realization of one dimensional arrays of nanometer sized holes or nano-craters on the surfaces of optical nanofibers by simply irradiating them with a single pulse of ultrashort light from a femtosecond laser. 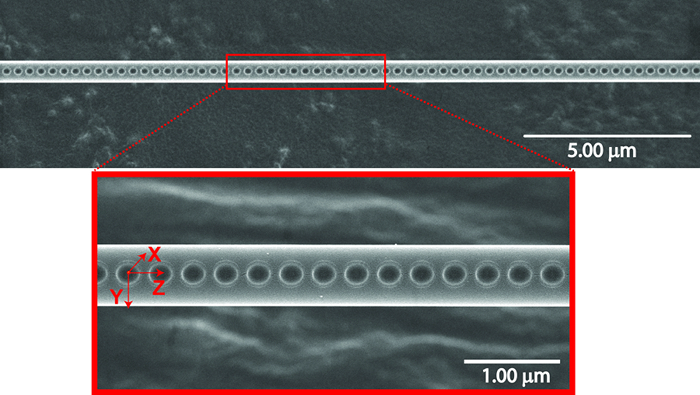 These so-called nanofiber based photonic crystal cavities are expected to find new applications in nanophotonics and quantum information science. Specifically, the researchers used a laser with a 400 nm wavelength and 120 fs pulse width to ablate thousands of 50 to 250 nm-diameter nanocraters with a periodicity of 350 nm over a 1 mm length in 450 to 550 nm-diameter nanofibers. Notably, in this procedure the nanofiber acts as a lens and focuses the incident laser light onto its "shadow side," and the use of only one pulse eliminates structural imperfections due to mechanical vibrations. The resulting one dimensional photonic cavities exhibited strong broadband reflectance and high optical transmission. The researchers state, "The strong confinement of the field, both transverse and longitudinal, in the nanofiber-based PhC cavities and the efficient integration to the fiber networks, may open new possibilities for nanophotonic applications and quantum information science."